REUNION 27-30 July 2006 in BERLIN! The announcement was made in May 2003 at our Asheville, NC Reunion. AS OF MARCH 31, 2006 OUR HOTEL HAS SOLD OUT AT LEAST ONE NIGHT OF THE REUNION WEEKEND!!! Therefore we have secured an "overflow hotel." The new hotel is still under the Best Western flagship and is called the "Queens Hotel BERLIN City West." Please note: Booking a reservation will remain the same as outlined below. Even though you will be booking on line with our Primary Hotel your reservation will be secured at the "Best Western- Queens Hotel" by our Best Western Management. The benefit of this is that "should a cancellation" come up at the Primary Hotel, ie: Best Western-Hotel Steglitz International your reservations will move into the cancellation slot in the chronological order that they were received. Should no cancellations, or not enough cancellations facilitate your reservation being moved to the Primary Hotel, then you will remain at the overflow hotel, the Best Western-Queens Hotel. This Hotel is 6 u-bahn stops away (on a direct line) from the primary hotel. Physical address is: Guntzelstrasse 14 The single rate remains at 70 Euros per night, but the double rate is slightly less at 76 Euros, all excluding breakfast. Their website is: www.queens-hotel-BERLIN.bestwestern.de BUT AGAIN, you need to follow the booking instructions below to secure this rate and the possible cancellation benefit. Select "Room type"....being sure to read "show description"
Then proceed down the reservation page. The hotel is family owned but now falls under the Best Western International hotel chain. It is very much an American-style hotel. Immediately across the street from the hotel is the Rathaus Steglitz U-bahn stop, out the back door is a major bus transfer station. Next to the U-bahn entry is a small urban park that holds a flea market every Sunday. shop, shopping, restaurants and American staples like McDonalds, KFC, etc. time in BERLIN for the same discounted rate. When you book your reservation the hotel will immediately charge you for the 1st night's stay. (please note: This is not a hotel policy but one we requested.) At our last reunion "speculators"
initial charge we hope to prevent some of this from reoccurring. company if they will charge a conversion fee for handling any foreign currency transaction. which begins on July 25. Lastly, our members also requested we avoid the school year. started those BERLIN Saving's Accounts?!!! 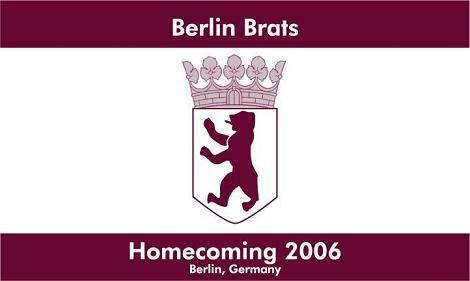 Please share this information with every BERLIN Brat you know including our Teachers! We want everyone to attend, know how the dates were selected and that their requests were honored. Visit this site often for more information or contact your Class Contact via the Class Contact page. Class Contacts are always the first to know. Make sure you have submitted current mailing information, tele #'s, your class year and the years you were actually at the old high school (TAR) or the new high school (BAHS) so you can be added to the Alumni Database and will receive the REUNION REGISTRATION PACKAGE when it gets mailed later this fall. We look forward to seeing you in BERLIN in '06!!! Click here for a list of RSVPs.